Seasons change. And what suited one time and place, no longer seems right. So we change. We adjust, we tinker, we try something out. Sometimes, the New works very well. So it was with the wire Christmas trees that Neighbor made for us out of tomato cages turned upside-down. He fastened strings of tiny white holiday lights to the ribs of the cage, and created two small twinkling trees. Husband set them on the urns flanking his studio door, plugged them in, and the studio had all of the cachet and charm of a sparkling gallery or shop in Manhattan. That was last winter. Then winter warmed, spring came, and one of the strings of lights failed. 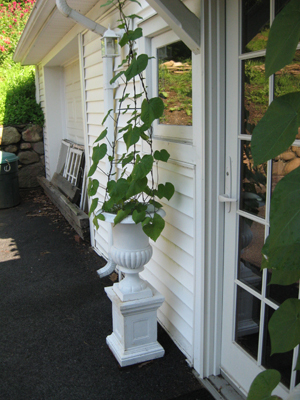 I suggested something new: Plant morning glory seeds in the urn, place the upside-down tomato cages over the dirt, and run wire from the tip of the “tree” up to the roof, and along the front edge of the roof. 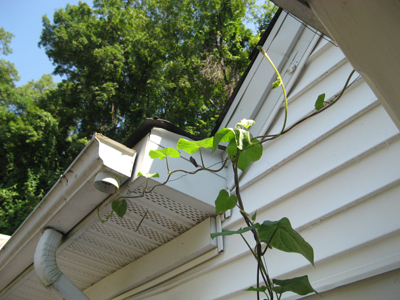 Allow the vines to grow up, and out, making a green edge to the roof line of the studio. 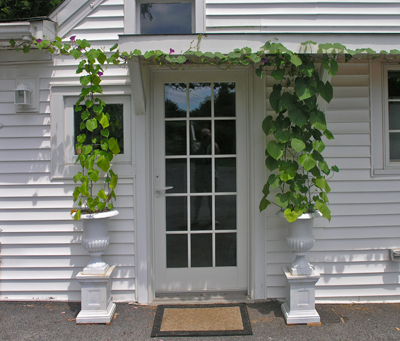 I was certain the studio doorway, framed in heart-shaped leaves and flowers singing glory to the morning, would appeal to my husband, his fellow artists and the art students that visit. 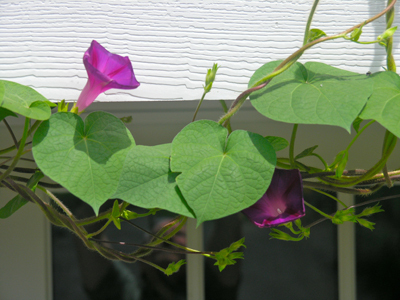 I bought a packet of Grandpa Ott’s Morning Glory seeds from the Seed Savers Exchange. I followed the suggestion on the packet, and soaked the seeds for 24 hours before planting. 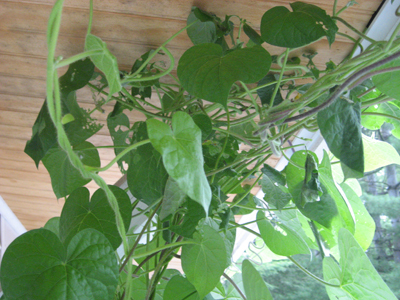 They germinated, finally, and the vines emerged, and grew up the cage ribs, exactly as I’d hoped. The entryway is framed. The vines draw your eye up and away from the dark asphalt driveway, to green, white, and then blue sky, and it beckons to the artist in us all. 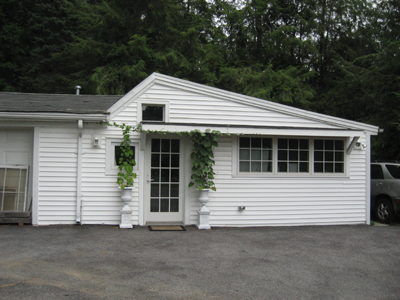 Looking across the driveway to the Art Studio. Bright sunshine on the vines enhances the welcome. Husband attached the upside-down "tree" to the urn with wire, to keep it stable in high winds or heavy rain. A vine's version of a traffic jam, as they sort out who stretches out on the roofline wire first. The left urn has a wire that offers a choice: Left over the Workshop roof, or right over the doorway and Studio roof? 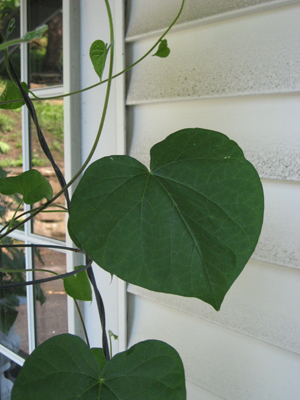 I love that this variety's leaves are heart-shaped. Taken with a flash, the throat of the blossom glows, and the unopened buds suggest ivory and pink torches. The color of the blossoms changes with the light, and their short appearance each days makes their beauty even more compellng. Thank you, Laura Ingalls Wilder, for putting it all into words for us. Both as a young girl longing for a life like Laura’s, and as an adult with pioneer tales of my own, her direct words speak to me. 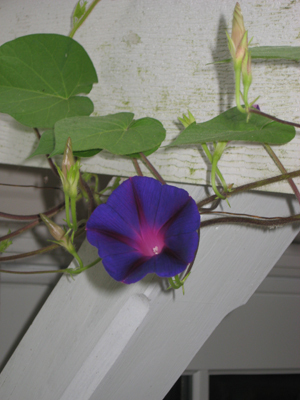 Morning glories sing. I love how you have put them in urns. I have areas I would like them, but really have no “soil” there—why didn’t I think of pots??? It looks great, Amy! 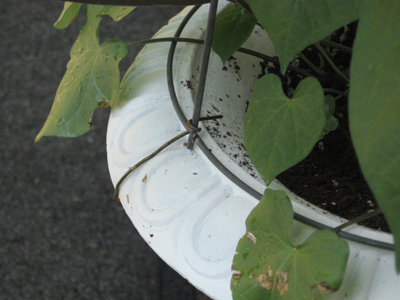 Yes, the pots contain those wildly rampant roots. Only downside is daily watering, because these vines are thirsty. But the Yankee in me is agreeable to this task in order to insure restraint. Let’s just keep a lid on this exuberance, shall we? Ayuh.